Young Magdalen and Jesus, brimming with youthful charm and arrogance, find each other and fall in love, forging a bond that is stronger than death. Their pleasure is overshadowed by a brilliant but unbalanced druid who knows a perilous secret about Maeve's past. The prequel to The Passion of Mary Magdalen. ©2007 Elizabeth Cunningham (P)2015 Audible, Inc. This is the true story she never told. It’s a balm my sisterhood soul that has been yearning for such truth and inspiring words. The Story as Maeve meant you to hear it! 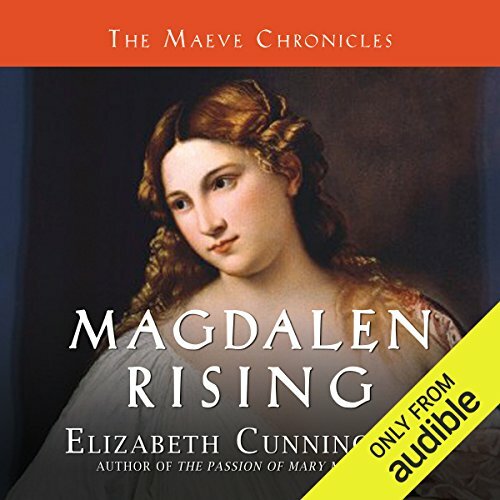 Would you consider the audio edition of Magdalen Rising to be better than the print version? It is a bit unorthodox for the author to be writing a review, but the audio format is new to me and is a work of art in itself. I love the words I wrote and I love hearing them spoken in Heather O'Neill's beautiful, expressive voice. What is better about the audio version is that Maeve is a first century Celt trained in the oral tradition. As such she is skeptical of the written word. Maeve and I are both thrilled that you can now hear the story as she always intended for you to do. What other book might you compare Magdalen Rising to and why? The Maeve Chronicles are comparable to other epic series, like Tolkien's and Gabaldon's. Have you listened to any of Heather O'Neill’s other performances before? How does this one compare? I have not yet, but I will. She is a superb reader! Who was the most memorable character of Magdalen Rising and why? Well, Maeve is second to no one of course. But I have a fondness for all the wild old women. The Cailleach, Dwynwyn and Anna the Prophetess. Treat yourself to these books no matter how many times you've read them or if you have never read them. Your life may be changed, as mine surely was in writing them. What did you love best about Magdalen Rising? The author's knowledge of the New Testament and her ability as a storyteller. Yes. She does a great job and continues to be one of my favorite narrators. Listened to the entire series and highly recommend it. The narrator is excellent, although I am only giving 5 stars related to the editing which had a few glitches. It seemed before some chapters the last sentence of the preceding chapter was cut off midway. I think 40 is one such example. there should be a separate ranking for editing, since there is not, I'm slightly downgrading the performance. The reader is probably the best that I've heard on audible. Excellent. Story is so captivating. I'm very glad to have heard this story and thrilled that there are more books in the series to further indulge! I love this series. And the narration is A M A Z I N G. This story has everything. So much incredible beauty in this book! It touched me in a very deep way. I can't wait to listen to the next books right now! The story is an old one, but told with wit, beauty, and plausibility from the feminine perspective. While it is a piece of fiction, it opens up the question of, could it have been? And, why not? We do not know what happened during those lost 18 years. One can only speculate. It is the story of a magnificent woman who suffered and loved deeply; a woman who gives us a glimpse of how it could have been. I would love to think something along this story-line could have really happened. And the narrator - what can i say! Heather O'Neill is extraordinary. She breathed unique life into each character. I WILL finish this serious. Could not finish. I tried, and I really wanted to like the book. This doesn't fit into the historical fiction genre. The narrator was very good. If it weren't for her narration skills, I would not have made it through my 3 hour attempt to complete the book. WARNING to faithful NETFLIX bingers!!! This book had me HOOKED from the beginning! Several times I've had to pause the audio because it made me laugh so hard I couldn't hear it!!! Maeve's story is empowering, inspiring, healing, captivating, and might have your Netflix account joining mine in converting the franchise to the online haven for tumbleweeds. The fire of Maeve's spirit is palpable throughout the entire book and has since become part of my own. This is a fantastic story written with great knowledge and wit! If you are looking for a great story about Mary Magdalen and Jesus with a new seed of plausibility, well then, this is it! Absolutely wonderful writing and great story telling. The author and narrator are both phenomenal! Absolutely loved every line, every moment. The story came to life with the teller and each character took on a unique identify of their own in its telling. Author has an incredible mastery over prose and metaphors that leaves you thirsting for more. Would read again.